Are YOU a Cool Cat or a Cool Cat-Lover? 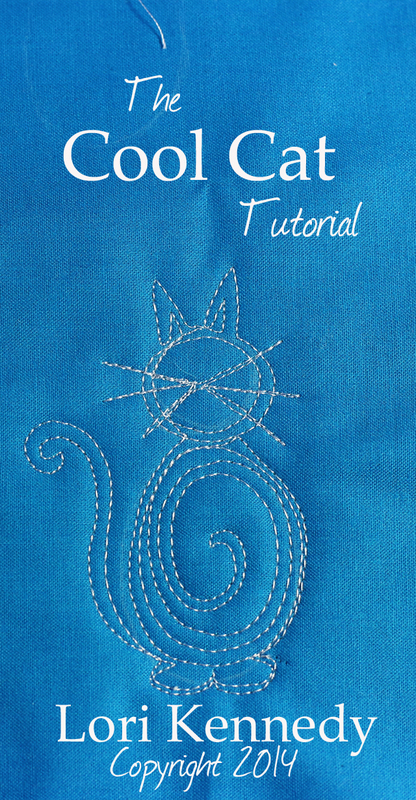 If you love cats, today’s Tuesday Tutorial is for YOU. Whether you choose to stitch a single cat in the center of each quilt block or stitch a clutter of cats along the border, this motif is sure to please all Cat Fans! Begin by drawing a circle head and an oval body. 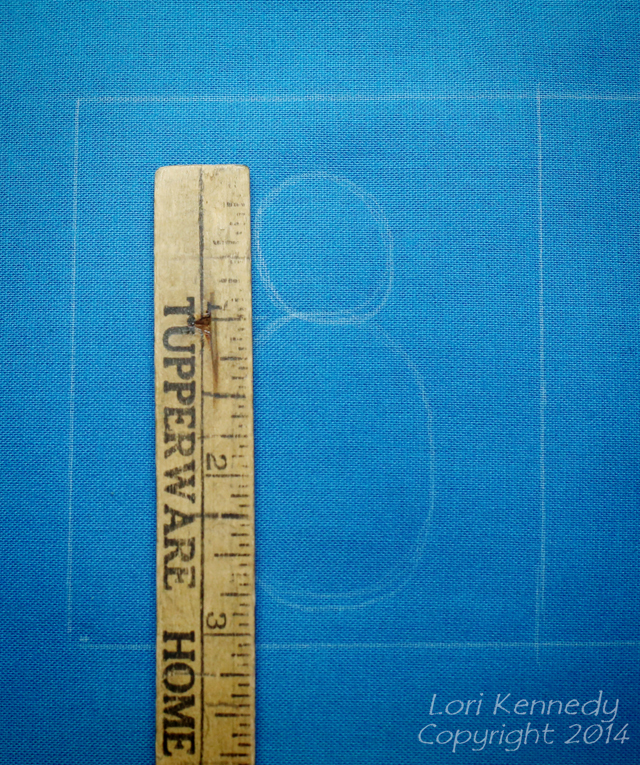 In the sample below, the head is approximately one inch and the body is twice as big-two inches. The quick sketch will help keep the cat proportional, but don’t fret about this too much–there are Fat Cats and Skinny Cats–everywhere. It’s more fun to have cats with personality than cats that are perfect. 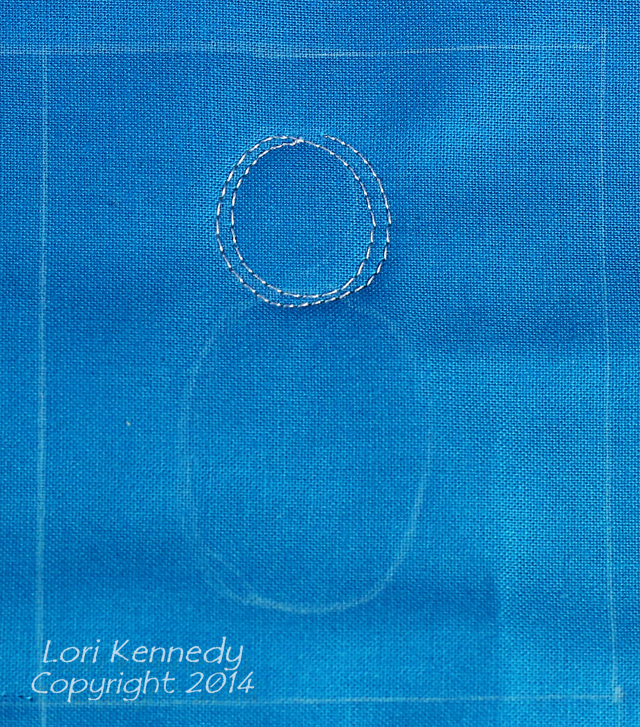 Start stitching at the top of the circle. Stitch around the circle twice and stop at the top. Stitch two double triangles to create ears. Next stitch several stitches around the left side of the circle. Stitch IN to the center of the circle. Then stitch ON TOP OF those stitches and OUT of the circle. End in the center of the circle. 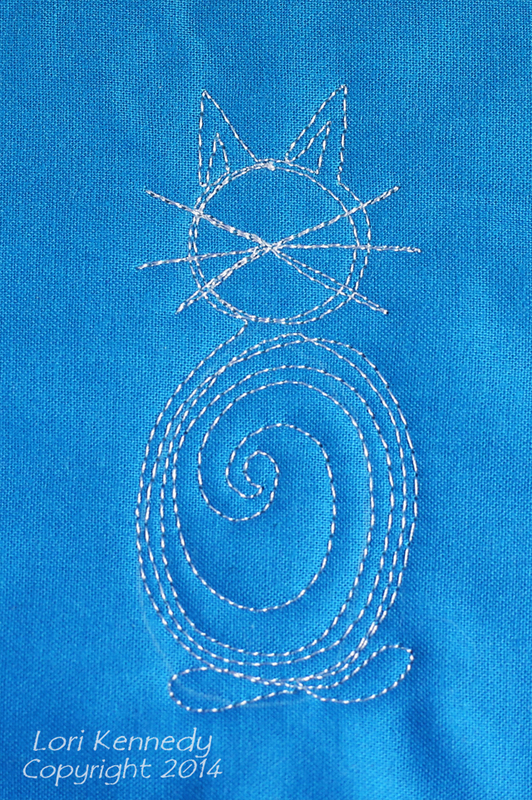 From the center point, stitch out and in five more times to create all the whiskers. End in the middle of the cat’s face. 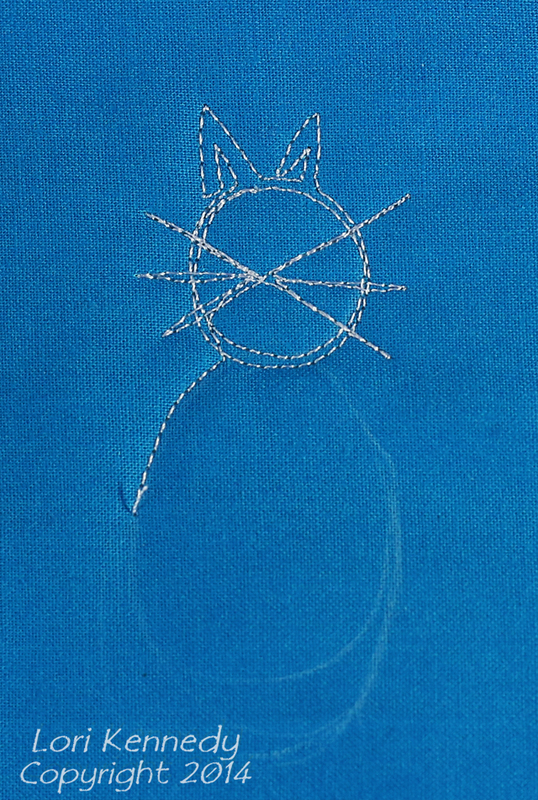 Finally, stitch out along one of the whiskers and around the head to begin stitching the cat’s body. Stitch around the cat’s body twice and spiral into the center. OR be creative here and stitch a flower or other design. 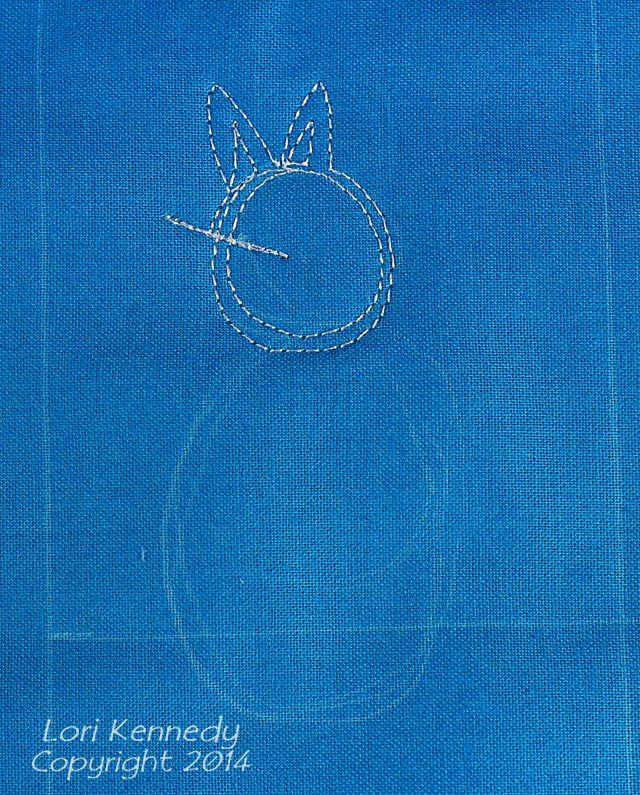 Stitch to the bottom of the oval and stitch two paws. 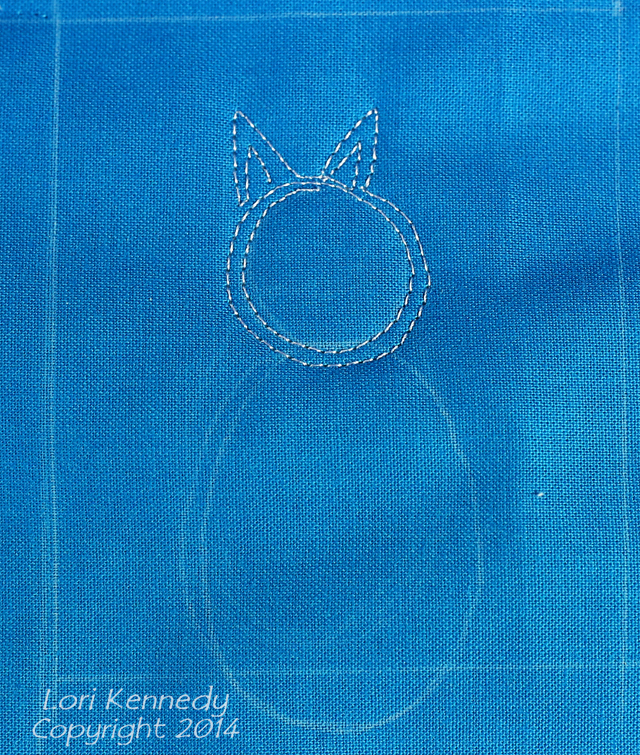 Stitch to the right or the left to create the tail-a curved line and echo back to the bottom of the cat. Now that’s one Cool Cat! Stitch five more Cool Cats and you’ll have a clowder. Wouldn’t this motif look great along the bottom of a skirt or on a small pillow? 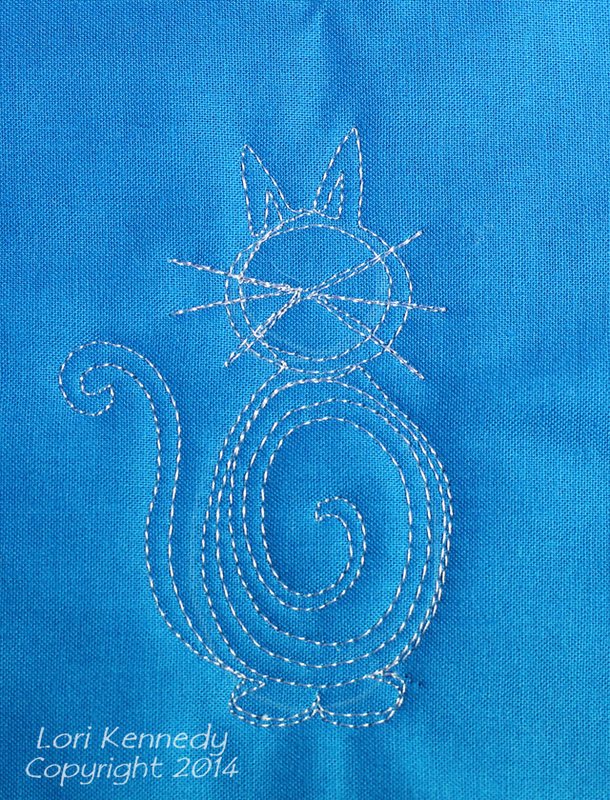 Make the cat much bigger by maintaining the proportions and adding more detail to the cat’s body–add a mouse or a ball of twine and you’ll have a small whole cloth quilt. Special thanks to our friend, Bea who provided the idea and inspiration to create The Cool Cat…she was persistent but patient! Hope you have a ball with this new design! PS…All tutorials, information and images are the property of Lori Kennedy at The Inbox Jaunt and are intended for personal use only. Feel free to re-blog, Pin or share with attribution to The Inbox Jaunt. For all other purposes, please contact me at lckennedy@hotmail.com. Thanks! PURRFECT for the a cat themed quilt I am making as a Christmas gift. Oh Lori…Thanks so much….it has been such a rough year for me that I look for a smile when- and wherever I can. Smiles came unbidden this morning. DO I love cats!!! One 17 pounder inside and 13 outside rescued kitties…all “fixed”. I can hardly wait to quilt my own kitty. Happy Thanksgiving…hope you have a wonderful, blessed day. I’m delighted to hear this little motif brought a smile to your day! What a cute cat! And just the thing I’ll need for my dd’s quilt 🙂 Thank you. I love kitties. You are right, there are no perfect cats. They are all very silly and naughty at times. I love these “puddin’s” you made. I am going to try this today!! “A clutter of cats” hahahahahaha! I think you coined a new phrase Lori and a very apropos one at that. I can just picture someone trying to work in the kitchen while cats weave in and around their legs. Love your cat pattern! It reminds me of the old wall clock cats. Super cute Lori! I am so excited to try this on some Christmas gifts for my cat loving family members! Meow! Too, too darling! Could you possibly do a generic dog or a dog bone for all the canoe lovers? Oops, CANINE, not canoe. Dad gum auto correct. 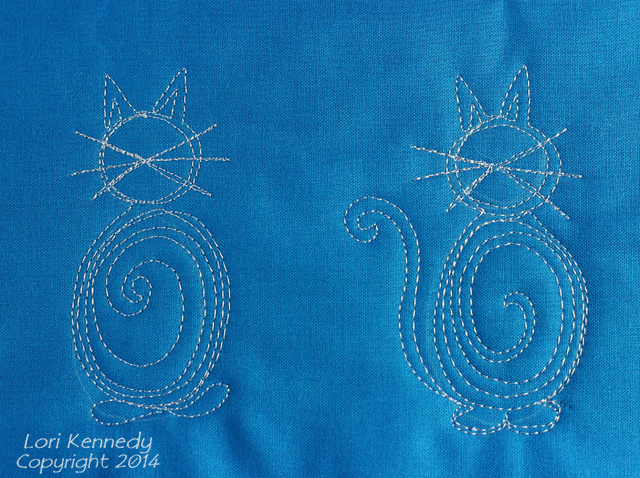 Love, love this kitty kat and can’t wait to try it on my next quilt. Have used many of your designs on a king size quilt and makes me smile when I look at them. The quilt will be given to my daughter at Christmas and can’t wait to see her smile!! So great to hear that you can use it right away! THANKS! Love your tutorials. They “click” in my mind. Now to find the time to play with more of them. I was looking for a motif for the corners of a border where I quilted boys and girls holding hands – the cat will be perfect. The quilt is for my granddaughter. Thanks for the “just in time” answer to my problem. BTW- I am honored that you featured the pincushion that I made for you yesterday – he does make one smile. It was a BIG HIT with readers of The Inbox Jaunt…Perhaps we could use a tutorial on how it was made??? Lori, your tut’s are the BEST, and you share them so willingly with us, thank you sooo much! I am going to make a Christmas ornament with your design…. my daughter loves cats, the idea is quilted in my head, lol Thanks so much! I’m thrilled you like the tutorials! Love the ornament idea!